All Saints Medals and Braclets. 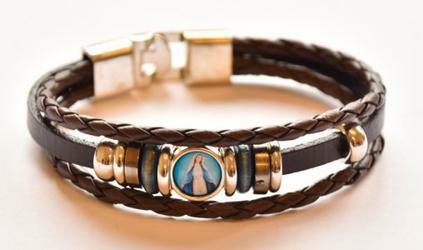 Beautiful Catholic All Saints Medals and Bracelet, Depicting Our Lady of Lourdes the Apparition, Bernadette, Miraculous Madonna, Virgin Mary, Fatima, Jesus and St Theresa to name a few. Gold All Saints Elasticated Faith Bracelet. Gold & Silver All Saints Elasticated Double Faith Bracelet. Hematite All Saints Bracelet with Medals. All Saints Gold Faith Bracelet - Elasticated. All Saints Plastic Medals Bracelet - Elasticated. All Saints Silver Medals Bracelet - Elasticated. All Saints Metal Silver Faith Bracelet - Elasticated. Elasticated All Saints Gold Faith Bracelet.